When I saw this wonderful chalkboard below made by Courtney from French Country Cottage for her dining room, I fell in love with it and knew I had to have one, too. Isn't her dining room the most fabulous thing ever? I would LOVE one this large, but my chalkboard would be leaning against the dining room wall on a high plate rail, so it had to be smaller and light enough for me to easily lift it up and down for changing the design. Last summer I found a large 39" x 33" wood picture frame for $10 at a yard sale that I thought would work perfectly. This is my finished dining room chalkboard decked out for Christmas and Valentine's Day. At over three feet tall, it still makes a big statement. I bought a piece of Masonite at Home Depot and had the store cut it to my measurements to fit inside the frame. (Masonite is a very smooth, sturdy, lightweight wood fiber product often used in place of artist canvas.) I just love that Home Depot will cut lumber for me, saving me the time and the hassle of digging out my own saw. 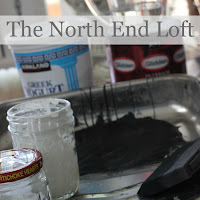 For the very best tutorial I've found about making your own chalk paint, along with three different recipes, I recommend checking out this post from Diane at In My Own Style. Or you can purchase ready-made chalk paint at hardware and craft stores. I painted the smooth side of the Masonite with an unsanded grout recipe of homemade chalk paint using a foam brush. I made sure to mix the grout with water until it was a very smooth consistency before adding it to my paint. The paint then went on easily and dried very smoothly. After the first coat dried, I lightly sanded with fine sandpaper and painted a second coat. To "cure" the board when dry, I used the broad end of a piece of white chalk to cover the entire surface with chalk then wiped it off with a clean lint-free rag, and it was ready to go. I used my staple gun to secure the chalkboard into the frame and started thinking about what to write on it. I found two tutorials that were a big help with how to get the neat professional-looking artistic results I'd seen all over Pinterest. One is Kristen's Simplified Chalkboard Drawing Tutorial at Ella Claire and the other is Diane's How to Draw Like an Artist on a Chalkboard at In My Own Style. After I have a quote I like, I use Microsoft Word to fool around with the font, the spacing and centering, and the size. When I have it just right, I print my final choice out on paper for a reference. I use a little math and a yard stick and ruler to make a lot of measurements and guidelines to center my letters both vertically and horizontally. A damp lint-free cloth and cue-tips dunked in water and squeezed out make great erasers. I turn on a movie to watch while I'm drawing on my chalkboard, and Tucker keeps me company looking over my shoulder. I think he's curious about what I'm writing. Last Summer, when it was 100 degrees out, I simply scribbled The Dog Days of Summer on my chalkboard. I think he liked that. 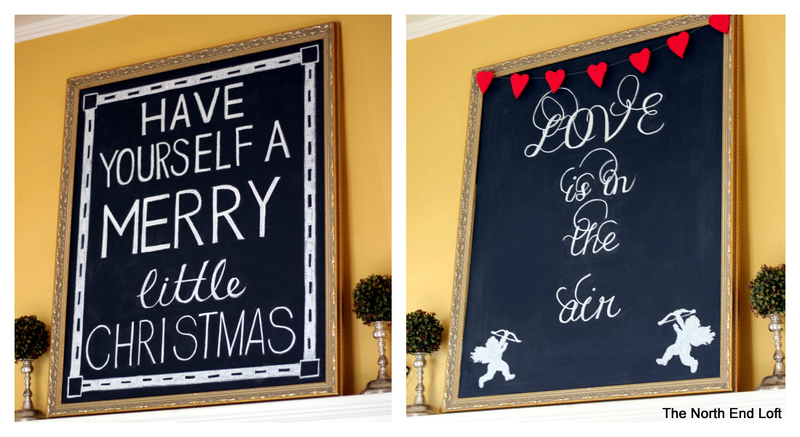 Large chalkboards are an easy and fun DIY project. I hope you'll be inspired to make one of your own. Thanks so much for visiting today, and please come again soon! I love chalkboards, the bigger the better! Your chalkboard is a beauty Laurel! I love big bold chalkboards! And your's is just adorable! Courtney has some of the most wonderful ideas in her home. So beautiful! Your chalkboard is so pretty! Beautiful project! Thank you for the links on how to make the paint. Great tutorial and if it's Tucker-Approved it's good with me. I'm going to have to dig out my chalkboard. The frame needs repainting - again, but you've inspired me! Thanks for all the tips, and the links to more! I love your chalkboard and really need to get something new on mine. Now I know how to get a better look. Great tutorial Laural. Courtney has a lovely dining room and I love chandeliers too. I LOVE your chalkboard! What a fun idea and super affordable! Maybe if I wrote recipes on it....it might inspired me to cook! LOL! Thanks so much for sharing! Hi to that sweet puppie dog!! I love your chalk board and I am definitely going to follow the links to figure out how in the world you got that great perfect chalk words!!! Un proyecto estupendo. Te sigo. great post Laurel! Love your chalkboard! I have a little chalkboard in the kitchen, but LOVE the big ones. Yours came out great, Laurel!!! This is such a cool idea and thanks for the turorial! Love it! ¡Hermoso blog y muy bellos trabajos! Te felicito. You are very talented! Very clever idea. Thanks for stopping by and leaving a sweet comment on my chalkboard. But look at yours! It's a work of art. I don't know that I would have the patience. I can just see one of the boys erasing it to doodle. I do admire all the pretty ones around blogland though.